1 of 4 The night before, heat oven to 425 degrees . Toss potatoes with 1 tbsp of the oil, 1/8 tsp of the salt and 1/8 tsp of the pepper. Spread onto a rimmed baking sheet. In a small bowl, blend chipotle, 1 tsp of the adobo, the mayonnaise, 2 tsp of the mustard, 1 tsp of the oregano, 1/8 tsp of the salt and remaining 1/8 tsp pepper. 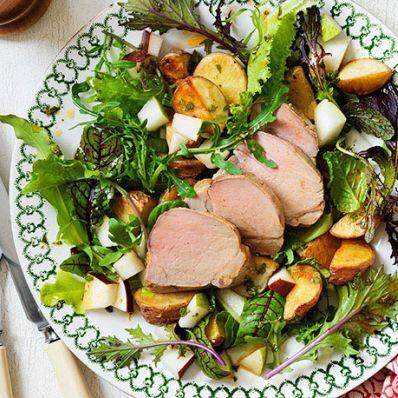 Brush onto pork tenderloin on a rimmed baking sheet. 2 of 4 Roast potatoes at 425 degrees for 35 minutes, stirring occasionally. Roast pork at 425 degrees for 30 minutes, or until it registers 140 degrees on an instant-read thermometer. Remove from oven and cover pork with foil. Cool both pork and potatoes and refrigerate overnight. 3 of 4 Meanwhile, whisk together vinegar, remaining 1 tbsp oil, 1/4 tsp salt, 1 tsp adobo, 1 tsp oregano and the honey. Wrap and store overnight. 4 of 4 At dinnertime, in a large bowl, toss together roasted potatoes, salad greens, diced pear and dressing. Divide among 4 bowls. Thinly slice pork and fan on top. Per Serving: 802 mg sodium, 5 g fiber, 34 g pro., 13 g Fat, total, 93 mg chol., 3 g sat. fat, 43 g carb., 427 kcal cal.